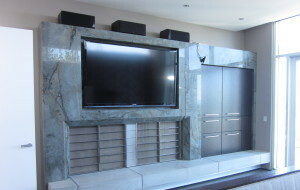 Haven’t been able to find that perfect piece to complete your project but you can envision what it looks like? Custom designed for you and your space means that you can best utilize the space you have as well as adding design elements that become architectural features in your home. We work with homeowners, designers, architects and design/build firms to design and fabricate your one-of-a -kind pieces. This underlit desk completes the office! This desk was custom made from Glass2, a discontinued product. However, onyx is a natural stone that has the same translucency and can be backlit or underlit. Wine storage like no other! 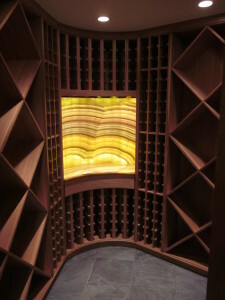 This radius wine storage features not only a green onyx counter, but is also backed by a curved panel. The lighting behind the panel makes the onyx appear to be a rich, honey color. Gorgeous! The large screen in this room now feels integrated into the room instead of just sitting on the wall as well as tying in the other features in the room; the built in storage and built in seating area. Bring us your ideas and we will turn them into finished elements that complete the space you dreamed about! My wife and I want to thank you and your staff for an outstanding job on our counters. Every aspect was handled in an outstanding manner. Jose did a great job in designing our island as did the layout man which did the placement on the slabs. Your three installers were very efficient and worked with but a short break to get the job done. Their leader was very informative when we had a question. All in all, it was a PROFESSIONAL job.